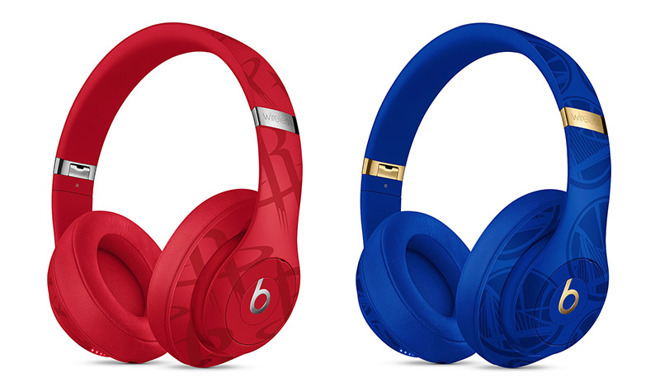 Beats Studio3 Wireless in "Warriors Royal" and "Rockets Red." Unveiled on Apple's online storefront, the new Studio3 Wireless collection adorns the headphones in six different skins, each featuring the logo and color of an NBA team. Six teams are represented in the first batch of what is expected to be a comprehensive collection of NBA-themed hardware. Initial options include "Celtics Black," "Warriors Royal," "Rockets Red," "Lakers Purple," "76ers Blue" and "Raptors White," representing the Boston Celtics, Golden State Warriors, Houston Rockets, Los Angeles Lakers, Philadelphia 76ers, and Toronto Raptors, respectively. Ear cups for the Raptors, Celtics and 76ers models are done up in those teams' secondary colors. Patterns created from team logos cover the headphone's exterior, while gold or silver accents highlight the metal folding mechanism and Beats emblem. Like other special edition Beats products, the underlying Studio3 Wireless headphone remains unchanged and features Apple's W1 chip for Apple ID-based device switching and Pure Adaptive Noise Canceling. An internal battery lasts 22 hours with Pure ANC on, or 40 hours in low-power mode, while Fast Fuel technology enables up to 3 hours of playback on a ten-minute charge. Beats signed a deal to become the NBA's official supplier of headphones and speakers last September. Under terms of the partnership, Beats provides various products to players that are shown off at events like the NBA Draft and All-Star game. Apple needs to strike individual licensing arrangements with each NBA franchise in order to manufacture products with their respective liveries. Whether the company intends to expand its Beats offering beyond the six teams represented in the first release is unknown. Beats Studio3 Wireless NBA Collection models sell for $349, with "Lakers Purple," "Rockets Red" and "Warriors Royal" slated to hit store shelves on Feb. 19. The two-tone "Raptors White," "Celtics Black" and "76ers Blue" are listed as coming soon. I checked with the Celtics and it turns out their colors are green and white, did y'all hear about this??!!?!? Black is just a very dark white. These are much more attractive than Beats other efforts. Wasn't a fan ob Beats before Apple, not a fan now. Just buy the aipods or the QC 35II / XM3 if you need NC. But I assume folks between 15-29 like popping colors and blue lights. YMMV, but for myself I have a couple of pairs of the Studio 3’s (including the new gray color ones), and I think that they’re the equal to the Bose QC 35II’s, and only slightly lesser than the Sony’s in ANC ability. I’ve listened to Classical, Jazz, Rock, and other genres of music with them, and they’ve sounded really nice to me with all of those various genres. There are certainly many different options for headphones to chose from if Beats isn’t for you, but I would recommend not dismissing them out of hand either, because ‘Beats.’ Have a listen to them for yourself if you’re able to, especially if you have a friend or family member that could let you borrow a pair for a while. Bose is garbage. Apple haters around the world are suddenly fans. You should probably check again. They've used a black uniform variation for years. I wouldn't say garbage. If you are looking for NC headsets with a max budget of 300-350 they are a top 3 choice. They don't even compete with the airpods since they are over ear and noice cancelling. p.s. How can "Apple haters" be cheap and afford Bose headsets? Make up your mind.